I went to 9a Regent’s Park Terrace. I wondered who Charles Unwin was. He had once owned this very same book I now owned. We had an odd kind of connection. Something which had once been in his house, in his hands, was now in my house, in my hands. I know exactly who this person is. I don’t think I should write anymore for now, save to say he is a great reader and buyer of second hand books. I have been dragged into several antiquarian booksellers’ over the years, and been the grateful recipient of many an intriguing, if tatty, volume. I bought the book from Smith’s, a large secondhand bookshop in Reading. So, I was almost certainly not the first owner. I imagine I bought it during the second half of 1980. I tended to write my address in books at the time, partly because I often left them behind on public transport never to see them again. I have to confess that I never read the book. After having kept it for 20 years without even looking at the first sentence, I thought I was unlikely ever to read it, so I took it to a charity shop. I have no recollection of Siroco’s or Parikia – that card was probably inserted by a subsequent owner. You are silent on whether you have read the book yourself – ideally, I think, it should have been owned by several people, none of whom got beyond Page 1. I hope this is helpful. Good luck in your attempts, if any, to track down the other former owners. And so it seems my imagined biography of the book was almost completely wrong. Charles Unwin wasn’t the first person to own it, he never went to Parikia. Charles never even read the book. There are still some unanswered questions though. Which charity shop did Charles take the book to, roughly twenty years after he originally bought it? Was it an Imperial Cancer Research shop? And how did Ian Rowbotham find my blog anyway? I like Charles’ idea of a book owned by lots of different people, but never read by any of them, although I feel slightly guilty because not only have I read the book, I’ve actually read it two and a half times. I read it originally back when I first bought it; in a slightly confused, feverish state. Then, in November I started reading it again and when I was about halfway through, I noticed the inscription on the inside front cover. I decided to go to 9a Regent’s Park Terrace. Having decided to do this, I went back to the beginning of the book and wanted to see if there was some way of tying the plot together with this idea of mine. But in the end, I hardly mentioned the content of the book itself. And although Charles Unwin never actually turned the pages or called my attention to any particular passages, his inscription (however functional it may be) increased the value of this book, for me at least. It’s a good book, Charles. I can lend you a copy if you want. It’s going to be made into a film. Anthony Hopkins will play Charles Unwin and Anne Bancroft will play me. I predict this post will be made into a Hollywood film. James Ward, yet again a wonderful post. Thank you. A Lovely read! Will keep coming back for more. so it is not charles unwin the publisher… well, it’s a marvelous book, some people think of it as the great american novel even though it was written by an austrian after a months quick travel 21 lectures in 28 days all over the bloody country. 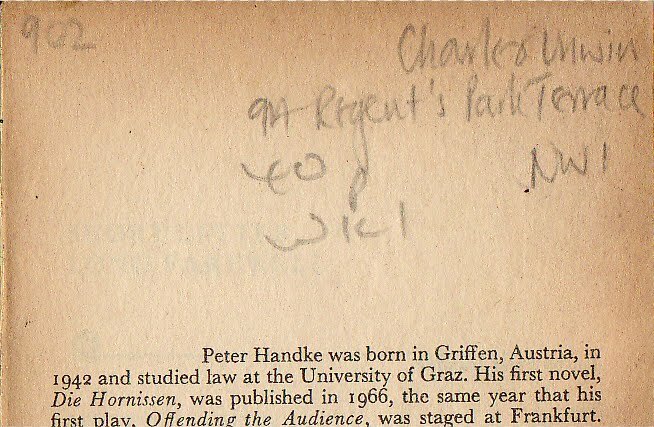 he, handke, has become the subject of my expertise, and i was the translator of about a dozen of his plays and of the novel ‘goalie’s anxiety at the penalty kick’. .
It’s the only Handke I’ve read, but I did enjoy it and will investigate further. I wandered here via comments on “The private life of books.” So very glad I did — this story is better than any currently sitting on my To-Read shelf. Thank you for sharing! and since he is part of a continuum, and certainly one of its high points, to goethe, stifter flaubert, among contemporary german writers to peter weiss, and he has nade fillm and incorporated nearly every aspect of film in his writing..
this link tht you will have to paste into your browser since this lovely blog is averse to them michael r.
Most facinating thing I’ve ever read. I actually just read a book called “The Manual of Dectection” with the star character being called Charles Unwin. It’s a bit uncanny! If this is the Charles Unwin I think it is, I was at Manchester Grammar School with him in the late 1960s and early 1970s. He was a great reader then! He came to mind when watching the South Bank Show this week featuring Sir Nick Hytner, a contemporary of ours at MGS, Nick was shown an old programme from a MGS Junior Dramatic Society production he was in (probabaly in 1968 or 1969) of Robert Bolt’s (another Old Mancunian) “The Thwarting of Baron Boligrew” in which Charles’ name was clearly visible as one of the young actors. We have been out of touch since 1975 when we went to differenty universities. I knew this Charles Unwin at university, and I recognise his old flat! Shame on you, Charles, for not getting beyond page one… but your reply was as elegantly written as ever. It looks like a nice flat.